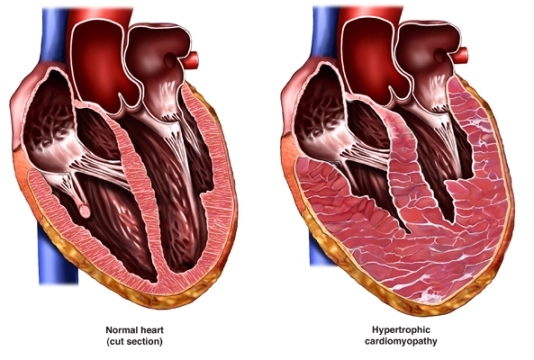 Cardiomyopathy is a type of heart disease. The damaged heart does not pump blood correctly. The disease usually progresses, and people develop life-threatening heart failure . People with cardiomyopathy are also more likely to have irregular heartbeats or arrhythmias . There are two categories of cardiomyopathy: ischemic and non-ischemic. Ischemic cardiomyopathy is most common. It occurs when the heart is damaged from heart attacks due to coronary artery disease . Non-ischemic cardiomyopathy is less common. It includes types of cardiomyopathy that are not related to coronary artery disease. Dilated—Damaged heart muscles lead to an enlarged, floppy heart. The heart stretches as it tries to make up for a weakened ability to pump. Hypertrophic—Heart muscle fibers enlarge abnormally. The heart does not relax correctly between beats. The heart wall thickens, leaving less space for blood to fill the chambers, so less blood is pumped from the heart. Restrictive—Parts of the heart wall stiffen. Thickening often occurs due to abnormal tissue invading the heart. Symptoms vary, depending on the type of cardiomyopathy and its severity. You will be asked about your symptoms and medical history. A physical exam will be done. A stethoscope will be used to listen to your heart. Cardiomyopathies often produce heart murmurs and other abnormal sounds. Heart failure may be due to blockages in the arteries. Treatments to relieve these blockages include angioplasty , stent placement , and coronary artery bypass surgery . These may lead to improved heart function and symptoms. For certain genetic causes, other treatments may also improve heart function. For many people, treatment is aimed at relieving symptoms and preventing further damage. If you are overweight, talk to your doctor about ways to help you lose weight . Eat a low-fat diet to reduce the risk and extent of coronary artery disease. Limit salt intake to reduce fluid retention. Follow your doctor's advice about exercise . You may need to limit physical activity. Angiotensin-converting enzyme (ACE) inhibitors—To relax blood vessels, lower blood pressure, and decrease the heart's workload. Angiotensin receptor blockers—Similar to ACE inhibitors. Hydralazine and isosorbide dinitrate—May be used with ACE inhibitors. Digitalis—To slow and regulate heart rate, and slightly increase its force of contractions. Beta-blockers—To slow the heart and limit disease progression. Spironolactone—To improve the outcome in people with dilated cardiomyopathy and advanced symptoms. A pacemaker may be implanted to improve heart rate and pattern. For people with hypertrophic disease, doctors may remove part of the thickened wall that separates the heart's chambers. Surgery may be needed to replace a heart valve. Another option is alcohol septal ablation. This procedure reduces symptoms and improves how the heart functions. For those with life-threatening, irregular heart rhythms, a cardioverter defibrillator may need to be implanted. A heart transplant may be possible for otherwise healthy people who do not respond to medical treatment. Candidates often wait a long time for a new heart. Those waiting may temporarily receive a ventricular assist device. This is a mechanical pump that takes over some or most of the heart's pumping function. Actively treat hypertension, coronary artery diseases, and their risk factors. This is the best way to prevent most cases of cardiomyopathy. However, other less common causes are not preventable. If you have a family history of the disease, ask your doctor about screening tests. Do this especially before starting an intense exercise program. Dilated cardiomyopathy. EBSCO DynaMed Plus website. Available at: http://www.dynamed.com/topics/dmp~AN~T114780/Dilated-cardiomyopathy . Updated September 5, 2017. Accessed September 13, 2017. Peripartum cardiomyopathy. EBSCO DynaMed Plus website. Available at: http://www.dynamed.com/topics/dmp~AN~T115915/Peripartum-cardiomyopathy . Updated April 20, 2016. Accessed September 13, 2017. Restrictive cardiomyopathy. EBSCO DynaMed Plus website. Available at: http://www.dynamed.com/topics/dmp~AN~T114748/Restrictive-cardiomyopathy . Updated August 28, 2016. Accessed September 13, 2017. Explore cardiomyopathy. National Heart Lung and Blood Institute website. Available at: https://www.nhlbi.nih.gov/health/health-topics/topics/cm. Updated June 22, 2016. Accessed September 13, 2017.